Tension and mistrust… I can’t think of a sentence to close with that doesn’t repeat, in different words, what I said in the first sentence (which isn’t actually a sentence). Loved the two Selkies Rebekah! To be so distrustful at her age.. =/ Poor thing. Aw, that’s adorable fanart. I’ve got one to send your way too, once I get around to scanning it. Poor Selkie. Todd better just be honest and stop keeping her guessing, haha. As one of those new readers in the past few days I just want to say, this comic is so cute. 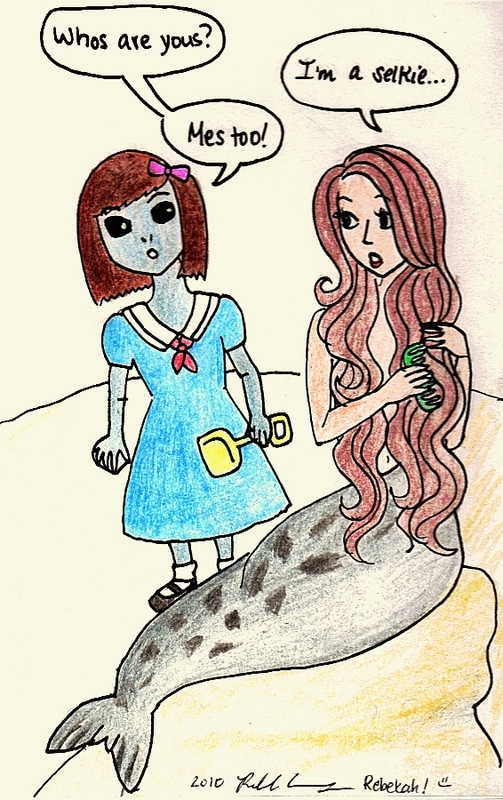 Does anyone else think Selkie is like a cross between Gollum and “So-and-So” from Teen Girl Squad? (except nicer than both of them?) 😀 I love this story, keep it coming. Yes… and thanks for not adding “The Ugly One” to that. “Ares you fulls of craps” – Another question so difficult to answer convincingly, it could be elevated to the level of “Does this make me look fat”. But I did have another thought re: Selki feeling like Todd is “fullls of craps.” Perhaps, being as she’s eight – perhaps she has not had the opportunity, yet, to find out that “Jurassic Park” was a book before it was a movie? That (that she doesn’t know that “Jurassic Park” was a book before it was a movie) is very plausible. I (like Todd, I guess) hadn’t thought of that possibility. If she thinks he’s offering a comic book rewrite of the movie she would have to think he’s making fun of her. Ooooooo! I loves cryptics answers guys! Just like Dumbledore or Gandalf! @alcor: My best guess is that it’s because Selkie has a speech impediment, that could be the hiss of air leaving the throat as the term is pronounced, in which case it would sound like Mes, yous, etc etc. Well you also should consider that she may be putting emphasis on certain words and that may affect how they sound. I know that sometimes when I get annoyed or angry I sometimes slur my words and say Shtupid instead of stupid and such. I love her in the second panel! I’ve read through a lot of wecomics, sort of a passion of mine, and this is one of the more unique ones Ive seen. In a good way! The plot is intriguing, the characters are personable and believable, and I truly care about where the story is going. Your comic is the first that has prompted me to leave an actual comment. This one is newer, and I would really like to see it continue. Lol fulls of craps she is soo cute! I’m on a re-read binge. This is the first strip where … the strip starts to become Itself. And not just a copy.